We spend most of our lives working for others; making sure they have enough money for everything; making sure their houses are paid for; making sure they have food on their tables. Wealthy people ALWAYS pay themselves first, before paying anyone else. This is most people’s attempt at saving money for their future. Only problem is…there’s rarely any money left over. This is also called the Not Having A Plan method of financial planning. The end result is that you end up 60 years old without a pot to ‘—-’ in (as mom would say) wondering what the heck went wrong. Here’s where Pay Yourself First comes in. It’s THE MOST IMPORTANT wealth principle you can learn and the most important money habit you can learn to do, right behind Financial Freedom is Your Choice, which we’ll get to later. Paying Yourself First means that every time a dollar bill flows through your hands from an outside source, you take a little piece of it and put it away and by putting it away we mean Save it, Invest it, Buy assets…anything that will help create an income stream for you when you no longer wish, to or need to, trade your time and energy for money (i.e., work at a J.O.B.). Paying Yourself First means that before you pay your rent or mortgage, buy those organic veggies, pay for the cell phone and the car, you take a piece out and pay yourself. Consider it a bill from your future self. Consider this for a moment…are you or aren’t you planning on being an old fart one day (that applies equally to both sexes by the way!)? If you are, have you considered that this older version of yourself is counting on you to prepare for his or her future right now? They want you to do the right thing NOW so you can do whatever you want when you get to be them later. So stop for a moment and close your eyes (after reading this whole paragraph, of course:-). Picture in your mind your older self. Really get some detail…what do you look like, where are you living, how are you living, how is your health, what color is you hair, are there pets, are you alone or with a partner? Just let whatever you see sink in. Now, ask your older self what he or she would have you do right now to prepare for that day in the future. Just listen and hear what they suggest. (NOW you can close your eyes:-). For a nice visualization of this process, download here. Paying yourself first is one of the most important habits you can establish with your money. So much so that every adult who doesn’t do this starting at a young age says they wish they had. • You’re establishing saving for yourself as a priority. You know that you are the only one responsible for your own future and you’re willing to do whatever it takes to make sure that older version of yourself is well provided for. • You’re establishing the oldest, most time-tested financial habit on the face of the planet. In Goerge Clason’s 1926 classic, The Richest Man in Babylon, his main teaching is to take a few dollars and put them away. It’s how the wealthy get, and stay, that way. • Have money deducted from your employer’s retirement plan (401k, 403b, etc.) if they offer one. Enroll in this plan as soon as you start work. Even if you don’t have a clue what to invest this money in yet, get in the habit of having the money deducted so you are living on less. Then, take the time to do some research or hire a financial planner who you pay for advice help you determine which mutual funds to invest the money in. • Start a Roth IRA. It’s one of the smartest things anyone can do, especially a young person! If you have a teen, get one started for them as well but remember that the money contributed to this account must be what is called Earned Income. If you have a business where you can pay them a paycheck for doing actual work for you, this money can be contributed into the child’s Roth IRA. Starting early so that the power of compound growth has a long time to impact this account can make a million dollar difference when your child is 60. • Open your own Investment Account in an online trading company like TDAmeritrade.com or Scotttrade.com or Fidelity.com. Choose one with the system that is easiest for you and look for a quality education component. • For lack of any better plan, open a high interest savings account at an online bank like ING Direct or FNBO Direct. Set up automatic transfers out of your regular bank account or directly from your paycheck if you can. It depends on whether you’re a male or a female. Women live longer, earn less, have fewer years of earning power (kids and aging parents), are widowed more frequently and end up divorced more often raising children. Women would be wise to pay themselves 12-15% or more each month. Men can start with the classic 10% figure and modify as needed. 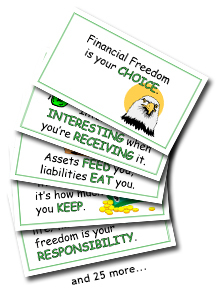 The more you put away now, the quicker you can be financially free later. Remember, Paying Yourself First is the most important bill you pay each and every month. Do it now while you have the time and the energy. 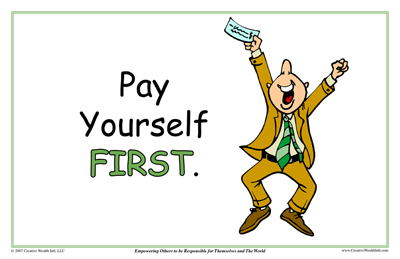 Did you pay YOUR self first today? Try it…you’ll like it!